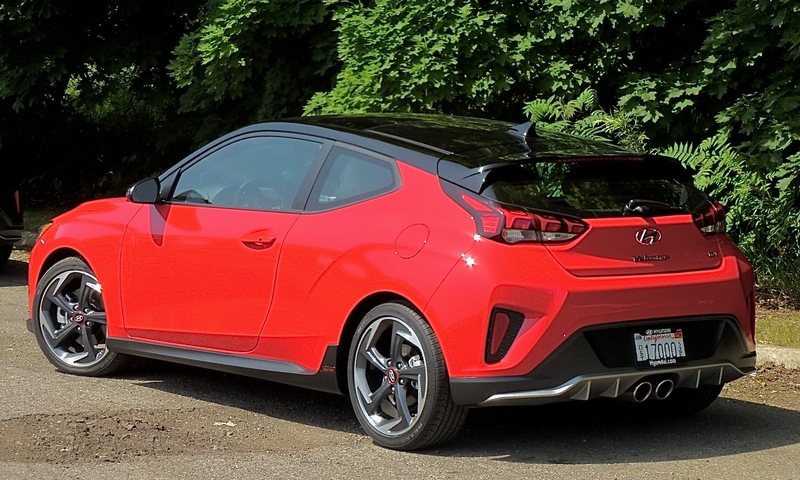 New 2019 Hyundai Veloster R-Spec is refined and adds performance features. In 2007, Hyundai showed its new Veloster, which was certain to be quirky as soon as it hit the pavement. That came in 2011, after it was introduced at the Detroit Auto Show. It sets new standards of being quirky, with one big door on the driver’s side, and two smaller doors on the passenger side. Who ever heard of a 3-door coupe? Curiously, about the same time Nissan brought out its Juke, an odd-looking compact that looked like a small SUV that had partially melted. That was quirky enough to look like a sibling of the Veloster, but they both endured in their separate ways. As the auto world turns, things change. Nissan decided to come out with a smaller crossover called the Kicks, and it will replace the Juke, apparently. If that means the Veloster must soldier on alone, it can handle it. Motor Trend announced there would be no change to the 2018 Veloster, but Hyundai fooled ‘em. Behind the curtain, Hyundai had prepared an all-new Veloster to replace the original, as a 2019 model. It is somewhat more mainstream, with some of the odd bulges rounded off. With two doors on the right, the Veloster is a 2-door coupe from the driver’s side. But the Veloster’s main trademark remains. If you approach it from the driver’s side, it is a compact little 2-door coupe; approach it from the passenger side, and it appears to be a compact 4-door sedan. In reality, it is both. The Veloster has a large door on the driver’s side, although you could still squeeze behind the driver’s bucket into the rear. But no need. On the passenger side, there are two doors, big enough in front, and conveniently sized for easy entrance to the rear. Mike O’Brien, the affable vice president for product planning for Hyundai America, calls it a “compact sporty car,” and that covers it well. It will continue the unique 2-plus-1 door design, and its center dual exhausts. 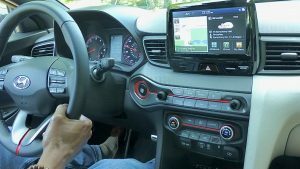 It also adds all the latest safety and security items, such as blind spot alert, rear cross traffic warning, and adds the ability to execute voice commands. Wireless charging gives it a progressive feature, and it also provides attention alert, to startle you back to full focus if it senses that your senses are fading. Veloster used to be underpowered, with an adequate normally-aspirated 1.6-liter engine. For 2019, there is a proven 2.0-liter 4-cylinder, with Atkinson cycle valve-delay operation, as seen in the Elantra and new Kona SUV. It delivers 147 horsepower at 6,200 RPMs and 132 foot-pounds of torque at 6,000. Those are decent numbers, but the optional engine is a prize — a 1.6-liter turbocharged 4, producing 201 horsepower at 6,000 revs and an impressive 195 foot-pounds of torque that maintains that peak from 1,500 to 4,500 RPMs — or, from idle speed to don’t-attract-the-cops. 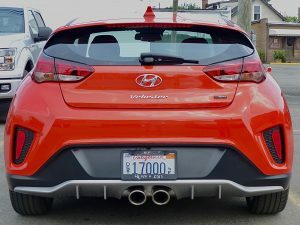 Hyundai acknowledges that Veloster is a niche car, but it fits the company’s carefully timed plan to offer performance options on top of economy and quality at an affordable price. O’Brien points out that the median age of Hyundai buyers is 55, and for Veloster it is 49, helping lead into that lucrative younger-buyer element. 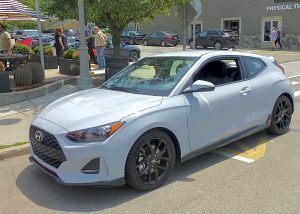 Also, 45 percent of Veloster buyers traded their cars in for another Hyundai product. Some of the odd bulges have been smoothed out, as the Veloster transforms into a smooth sporty coupe. The new Veloster, however, might prove to be a destination more than a stepping stone, because along with all its features that are above its quirkiness and station, it also adds a strong dose of performance. Hyundai had a regional introduction for the Veloster and the Kona, in Detroit. Part of the reason, officials said, was to show the U.S. media that this time Detroit is serious about recreating itself and eliminating its long-standing blight and boarded-up locations. So part of the programmed drive route took us through some urban areas so we could see for ourselves. By luck, I had enlisted an old friend, Frank Washington, as codriver. Frank and I have often driven together, but this time it was special, because he’s a black man who has lived in the tough areas of Detroit, and as we drove, he was able to give me a graphic tour of what new projects are happening and what historic site it might have been. 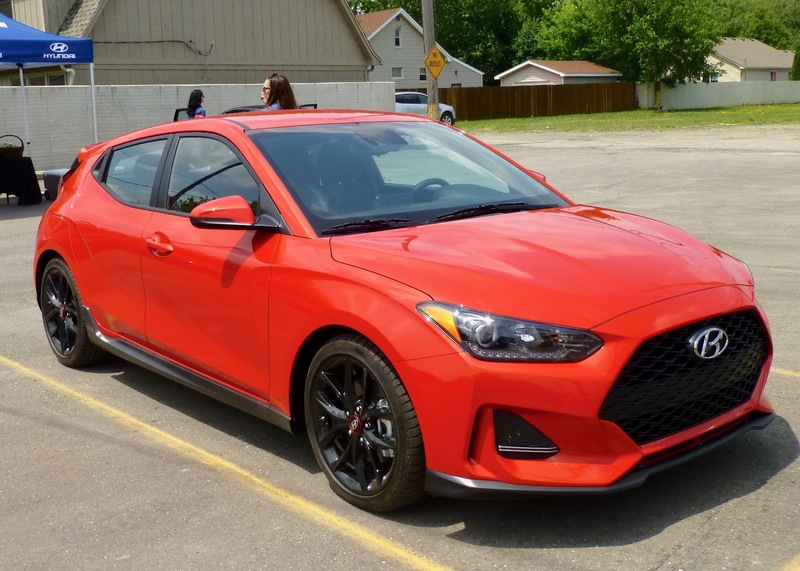 As it turned out, we drove only the turbo 1.6 version of the Veloster, and were impressed, especially with its coordination with the 7-speed dual-clutch automatic. With paddle shifters on the 7-speed, we were impressed with the car’s handling. 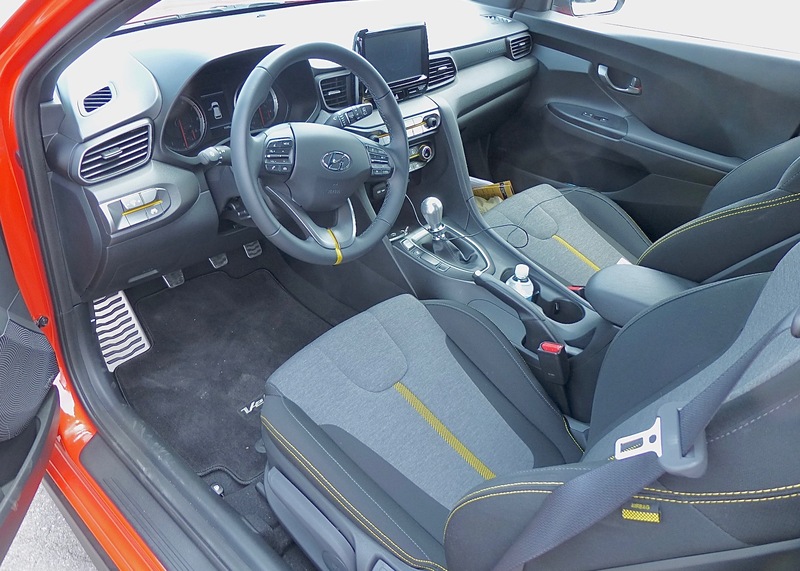 Cleanly restyled interior enhances driving pleasure with Veloster’s new features. We were supposed to switch to the 2.0, but instead I jumped at the chance to try the sportier “R Spec” version, with flashier appearance and Hyundai’s homebuilt 6-speed stick, that shifts as smoothly as any manual in the industry. Suspension has been modified, revised in the front, with multilink replacing the beam unit at the rear, which enhances all Veloster new models, but the R-Spec adds special 18-inch alloys with high-performance Michelin Pilot tires with the new suspension stiffened and steering also tightened, plus an enhanced “exhaust character” gizmo. You can set the car for normal, sport, or smart, and if you like the exhaust sound, you can pipe in “active engine sound” and either increase the volumn or eliminate it electronically through the audio system speakers. Fuel economy rates 28 city and 34 highway in the Ultimate 1.6-turbo, while the R-Spec offers 26/33. The 2.0 should get as good and maybe more miles per gallon, just because you wouldn’t be expected to drive it as hard. On the 4-door side, Veloster also houses surprisingly large storage space under the hatch. 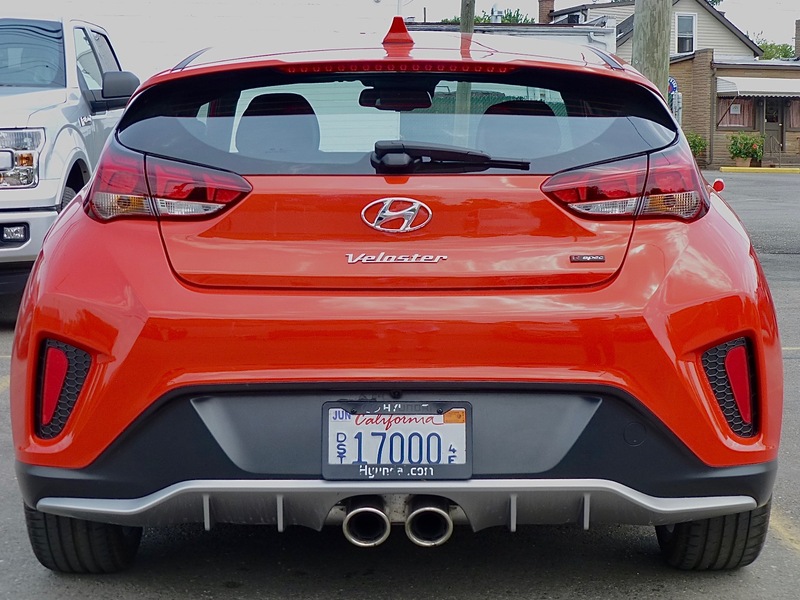 With a length of less than an inch longer, at 166.9 inches, and less than an inch wider, at 70.9 inches, the Veloster has the same height and wheelbase, but inside it takes better advantage of what’s available. Mike Evanoff, manager of small car product planning, said that cargo space behind the second row seats is more than in the Volkswagen Beetle, Mini Cooper, Fiat 500, and Toyota C-HR — all of which might fit into the “quirky” corner of their showrooms, but none of which can match the Veloster’s performance. On top of that, when you select the 1.6 turbo you get the choice of 6-speed stick, automatic, or 7-speed dual-clutch transmission with paddles, while the R-Spec offers stick only. Perhaps the best news is the pricing of the new Veloster. The basic front-wheel-drive with the 2.0 stdarts at $18,500. Move up to the automatic and it’s $1,000 more. Moving all the way up, past the Ultimate’s impressive feature upgrades, to the top of the line Turbo R version, and it’s a mere $22,900. Various interiors show style upgrades for 2019. For all that performance, and 30-plus miles per gallon, starting under $23,000 is a bargain for shoppers looking to downsize, or for a second car as an urban runabout, or for sending a kid off to college with a safe, solid vehicle. Among the features, Evanoff said the customers most-want the blind-spot detection/warning, but what might be most important is a sophisticated new advanced emergency braking feature, which not only warns you if you’re closing too fast on the car ahead, but will apply full braking to help you stop in time to avoid an impending accident. 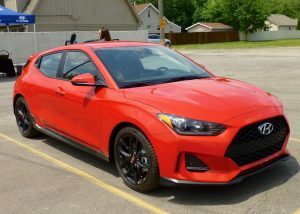 Known for building durable and trouble-free cars with great mileage, at bargain prices, the value and safety built in to the Veloster will now be augmented by a new high-performance division, also, which will be called “N Brand.” Other models will follow, and there will be aftermarket availability in the near future. The “N” comes from Namyang, which is the core development site in South Korea for all of Hyundai’s somewhat subtle performance operations. The punch in the Ns will come from ideas brought forth by Albert Biermann, hired away from BMW, where he had a hand in developing that company’s “M” models at all levels. Maybe it’s logical that he follows up the M with the N. And maybe it’s about time Hyundai takes so much of what it’s learned in various types of racing and pours it into a high-performance specialty division. Spoiler adds sporty flair with center-mounted exhaust pipes that can be tuned through R-Spec audio. Otherwise, settling for the “normal” new Veloster is impressive to begin with. It’s been most of a decade since Hyundai stepped out of its mundane stature and developed and built its own high-tech engines, strengthened its bodies and frames with high-strength steel from its own plants, built its own transmissions, added considerable style, and steadily improved on its reputation for high quality and efficiency with cars that offer more than the modest prices might suggest. 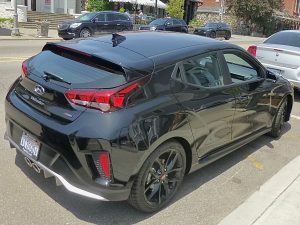 The 2019 Veloster now means you can choose to combine that reputation with the cute and quirky leader and now gain some real performance fun.